Presto performed a metal restoration project on the exterior of the First National Bank Building in Lansing, Michigan. The client called after a local consultant advised him that Presto was the right service and product provider to tackle the intricate surface. The unique design of the building included the restoration of the metal "fins" that would require detailed work with an experienced team and an efficient product. Presto's products of choice for such a project is EnviRestore Metal Stain Remover and Metal Protector HD. Both products work "hand-in-hand" to clean and preserve the restored surface. The result of the architectural metal restoration was exceptional; creating a brand-new finish which will retain its appearance for years to come. For more information on our metal restoration process and products, contact us at 1-800-693-1228 or Click Here. If you have a building with a stone, metal or glass exterior that needs attention such as maintenance, restoration and protection, visit our website to complete the Request A Proposal form. If you have questions, contact us at 1-800-693-1228. Let Presto return your building's surface to a like-new appearance. The restoration of the Children's Primary Hospital in Salt Lake City, Utah included stains on a massive facility of the architectural aluminum panels as well as the window frames. After calling local contractors to find a solution to no avail, management called Presto Restoration Products & Services to help find a solution to the problem. Presto performed successful testing to remove all staining and make the window frames and aluminum panels look new again. They were then awarded the contract to perform the metal restoration and protection services the facility required. EnviRestore Metal Stain Remover and Metal Protector MD were used to successfully complete the project to the client’s satisfaction. Presto was contacted to develop a scope of work for cleaning The Old Scotia Bank Building in San Juan, Puerto Rico. The building's envelope is comprised of marble travertine panels. This beautiful building material suffered from decades of neglect and had serious black staining on the majority of the surface. Furthermore, local contractors had damaged a nearby building containing the same stone material during a previous restoration service. Presto's task was to find a way to clean the sensitive material without damaging it, and find a suitable protective treatment to preserve the finish after restoration. After the cleaning process, Presto's LeachStop which was applied after testing and showed an impressive ability to waterproof the surface of the stone. In 2014, Presto Property Services was contacted when other contractors were unable to restore the windows and frames on this beautiful two building property. Upon our site visit, we recommended The Glass ReSurfacer System and demonstrated the results for Nicklies Development, the building owners. In addition we recommended Leachstop instead of the 40% silane which was planned during the clean and seal process. Presto Property Services was awarded the exterior restoration as a result of successful demonstrations at the site, and in consideration of our competitive pricing. Nicklies Development needed the work completed within a tight time frame in order to clean the exterior façade and list the fully leased building for sale. We were able to meet their deadlines and provide exceptional restoration results for severely damaged architectural materials. In 2013, Presto Property Services was invited to submit pricing on this impressive facility after a recent purchase by Neyer Properties. Upon receipt of the RFP, Presto provided an alternate Scope of Work using Presto Restoration Products to restore the façade. In 2014 The Glass ReSurfacer System produced spotless results on the vision glass, while EnviRestore Metal Stain Remover made the frames look new again. Leachstop was used on the precast after cleaning in order to help prevent future minerals from leaching out of the precast onto the newly restored window glass and frames. The following building restoration services were performed at Woodfield Crossing II. In 2008, these three buildings were completely restored using Presto's products and services. 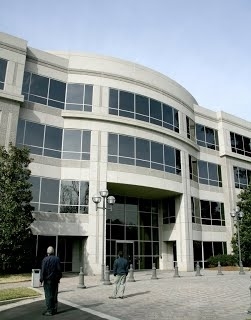 When Bellsouth was purchased by AT&T Lenox park came with the deal only the building were dirty, stained and not in the best condition due to lack of proper maintenance. Presto was called to the rescue. We were able to specify products for each restoration services needed for every inch of all three buildings. Located within a massive development section of Atlanta, coined the “Midtown Mile,” 1100 Peachtree Street, built in 1991, had no choice but to keep up with the horizon of competition – new, neighboring, commercial buildings. Since the opening of this high-profile, 28-story, 500,000 sq. 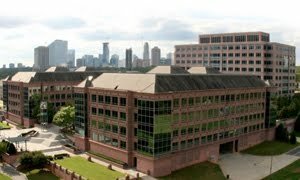 ft. building, the exterior windows were cleaned every six months using industry standard methods involving tap water and dish soap. This process enabled the development of stains on every inch of the building. These stains are best described as soap scum on the glass, metal and stone surfaces. Carter Real Estate and owner, Manulife Financial, chose to restore the entire exterior of 1100 Peachtree Street using Presto Restoration Products and Presto Property Services. Much research was conducted before the selection of a service provider to ensure that 1100 Peachtree Street received the platinum treatment. It became clear that Presto products and techniques were the right fit for this property, not only for their unsurpassed results, but for the long-term return on investment they bring. After performing glass restoration, stone restoration, and metal restoration, we implemented a maintenance procedure including cleaning both the stone and the windows with de-ionized water. If properly maintained in line with Presto’s recommendations, this property will never need a full-building restoration again. a STRONG STATEMENT FOR THE INDUSTRY, A WAY OF LIFE FOR PRESTO. Since 2002, Presto has performed services ranging from glass restoration and window cleaning to caulking and stone restoration on the exterior of the CNN Center, and both towers at the Omni Hotel. Our most recent project included cleaning the stone on the North Tower of the Omni Hotel and applying Elasticone stone sealant to the surface of the stone. This project was performed in wake of the devastating tornado that ripped through downtown Atlanta. Due to the storm, multiple companies were on site working diligently to perform various repairs. Careful planning allowed us to successfully complete the project, and work around the numerous crews. 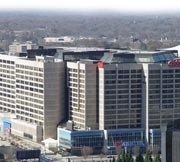 In 2008, the Omni Hotel at CNN Center's limestone facade was restored using Presto's products and services. In 2006, 11460 Johns Creek Parkway was restored using Presto's products and services. In 2005, 4205 River Green Parkway was restored using Presto's products and services. In 2004, 2400 Century Parkway was restored using Presto's products and services. In 2007, 4050 Esplanade Way was restored using Presto's products and services. The Centergy Building is a class A office space which began experiencing glass stains less than 5 years after it was built. This property is located on a major highway, and receives above average exposure to environmental pollutants. These pollutants quickly attached to the building requiring full building restoration. We performed glass restoration, metal restoration, and stone restoration in order to restore the entire façade to it’s intended condition. After the restoration process, we applied silicone protective treatments to each surface in order to help protect against future staining. Scheduled maintenance procedures ensure that the architectural materials will remain in beautiful condition for years to come. From 2001 to 2006, The CNN Center contracted numerous restoration projects with Presto. In 2008, 1001 Summit Blvd was cleaned using Presto's products and services. In 2007, the entire exterior of 475 Technology Parkway was cleaned and painted.